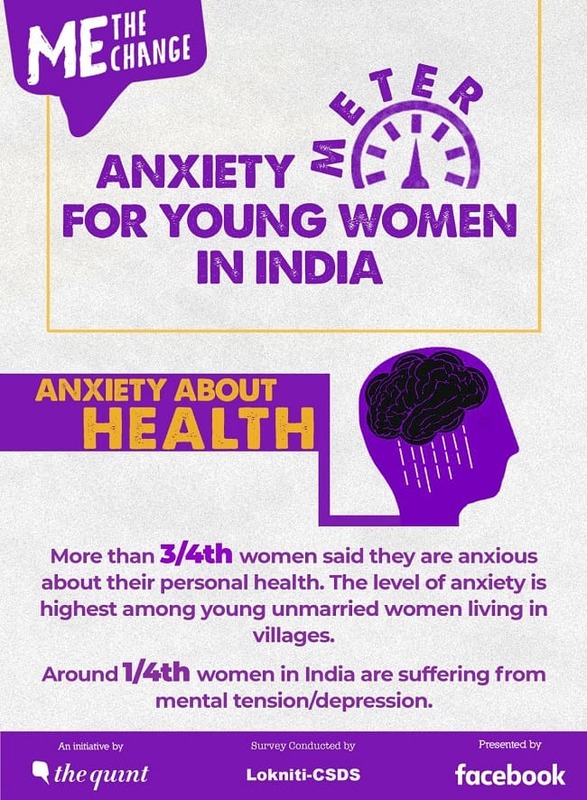 Me, The Change: What are India’s young women voters anxious about? The survey looks at what 5,000 first-time women voters across 10 states think about access to health, education and personal freedom. ‘Me, The Change’ is The Quint’s campaign for the first-time women voter who has an achievement to her name, however big or small. As part of the campaign, The Quint is accepting nominations for these young women achievers and showcasing these stories. If you know someone who fits the bill, let us know by emailing at methechange@thequint.com. Nearly one-third young Indian women, who will vote for the first time, frequently suffer from mental tension or depression, according to the Lokniti-CSDS Quint survey as a part of the ‘Me, The Change’ campaign presented by Facebook. But what are the young women voters of India anxious about? The survey looks at what 5,000 first-time women voters across 10 states think about access to health, education and personal freedom. This is the first in a series on the survey’s results. The survey found that a little more than two out of five young women are frequently anxious about their studies. Half of the young women surveyed in big cities suggested that governments should provide financial support for their education. A little more than half of young women students and job seekers in India are anxious about their career, and the anxiety is highest among young women in villages, the survey found. What do first-time women voters want the government to do to lessen their anxiety? Almost half of the young women participants (49 percent) suggested that the government should generate employment as a way to resolve the issue. Along with career-related anxieties, good educational facilities is the second-most important suggestion for the government to tackle. One out of 10 young women wanted that the government should provide financial aid like scholarship, monetary help to poor girls to help relieve their anxiety about career choices. More than three-fourth women participating in the survey said they are anxious about their personal health. The level of anxiety is highest among young unmarried women living in villages. The proportion of young women voters among the overall 31 percent, who frequently suffer from mental tension and/or depression, is higher in towns. On the contrary, 52 percent of the young women living in big cities never feel mental stress or tension, according to the survey. The original article published on The Quint can be found here.